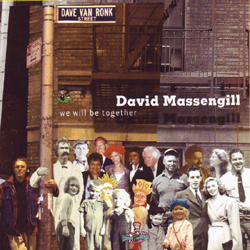 David Massengill "We Will Be Together"
Gadfly Records is proud to announce the release of "We Will Be Together," a new album from wildly creative storyteller and songwriter David Massengill. Massengill offers a new CD that includes fresh tracks that foretell a series a future projects: a Dave Van Ronk tribute album, a collection of fairy tale songs, a follow up to his previous album of songs about his hometown, and more. For fans of Massengill, he’s at the top of his game! Known for such signature songs as "Number One in America," "Rider on an Orphan Train," and "My Name Joe," Massengill has long been widely regarded as one of the most articulate and creative performers of the last two decades. creativity and honors the widespread roots from which it springs. this album allows us a tantalizing peek at all of them. His tributes to friend Dave Van Ronk are the best ones out there.